Fall wedding centerpieces can be achieved using nature’s most gorgeous leaf colors and abundant harvest foods. It can also be sober with wooden accents and cream and pastel colors. 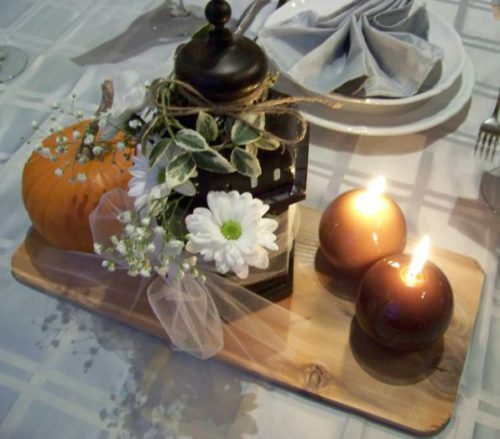 I’ve been looking for different ways to add some fall spirit to a wedding table. I’ve found many spectacular table decorations worthy of a Las Vegas Cirque Du Soleil show. The following fall wedding centerpieces are not quite like that. In fact, they are unique with natural, heartwarming elements. To me, a fall wedding has a rustic, natural essence. It doesn’t seem to fit with black light neons, glow sticks, nightclub decor and other flashy and impersonal equipment. Bats, skulls, and other Halloween artifacts. Autumn season is all about contrast. On sunny days every single leaf on a tree comes to life with the intensity of their vivid colors. On a rainy day, the light of a candle flame provides a warm cozy feeling. Cream color and vanilla scents with dried lavender and baby breath flowers can make a beautiful wedding table centerpiece. 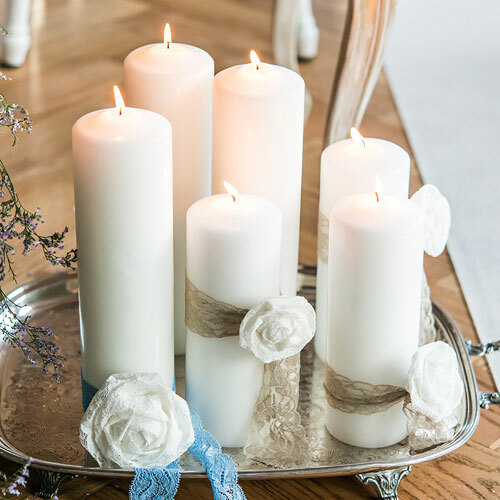 Use different heights candle pillar together on a silver tray to maximize light reflection. Moreover, add small details like rosemary fresh rosemary sprigs and your favorite fall flower variety for your guests to admire. A fall wedding celebration benefits from the most beautiful golden light due to the sun position at this specific time of year. 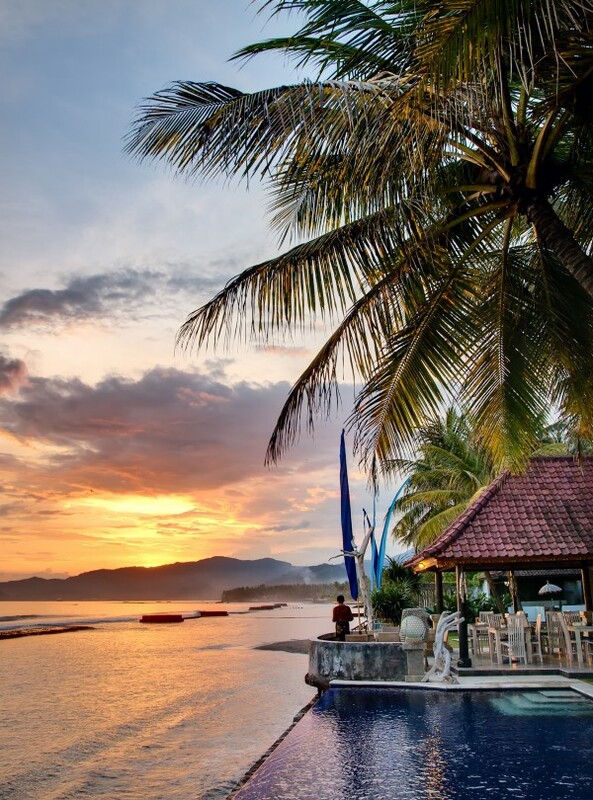 While the sun sets faster every day, it also covers everything in a heavenly light. A good way to add some of that glow to your wedding is by adding mercury candle votives to your centerpieces. These will make the wedding tables look stunning as the evening celebration begins. 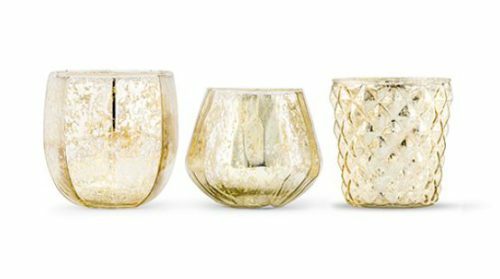 Pair the gold votives with chrysanthemum flowers, pumpkins, and squashes for a truly seasonal wedding centerpiece. If like me you love the fall season for its breathtaking colorful landscapes, earth and wood scent, warm sun and fresh breeze days, you will love these ideas. These pictures represent this beautiful time of year and recall the Thanksgiving celebration spirit. In autumn, pumpkins and squashes are grown locally in the northern part of America. Therefore, it’s a good way to encourage our local farmers and economy. Support your regional economy and incorporate these one-of-a-kind fruits in your decoration. They also come in many different shapes and colors that you can use to better match your wedding colors. There are many innovative ways to decorate using pumpkins. For a wedding, you just need to add your theme colors, mix them with white and seasonal flowers. Some people also choose to spray paint pumpkins in matte white, silver or bronze. Using such colors to ornament your centerpieces will turn a simple table decor into magnificent work of art and a pleasure for the eyes. 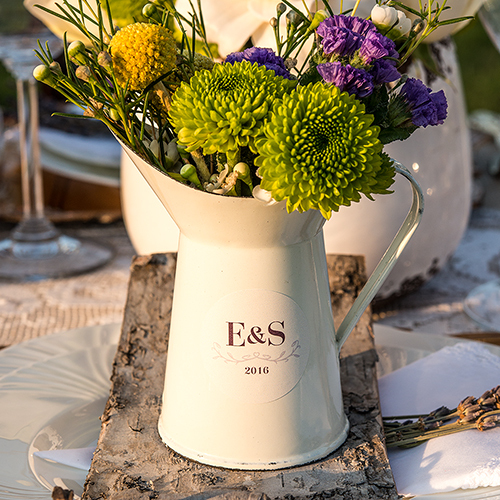 Add a touch of charm and rusticity to your tables by using tin metal containers like this pitcher. Incorporate a mix of wildflowers and mix in large blooms with delicate one. Greenery is to be used without restraint: it will make the bouquet look fuller and will highlight the flower colors at a much lower cost than using only flowers. Autumn is also symbolized by the abundance of tall ornamental grasses. Using varieties like the Fountain, Pink Muhli and feather Reed grasses will provide a majestic feel to your table decor. 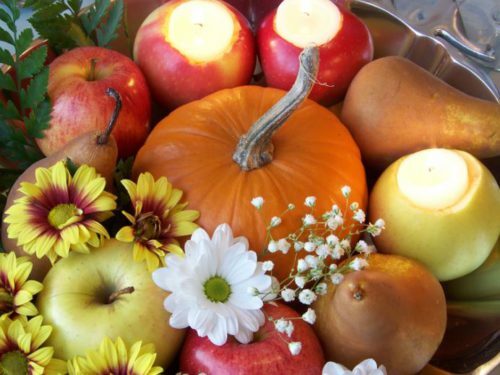 A good way to save money on your autumn wedding is to use fall harvest fruits. Incorporate them in your decorations everywhere, from celebration table centerpieces to ceremony guest benches. 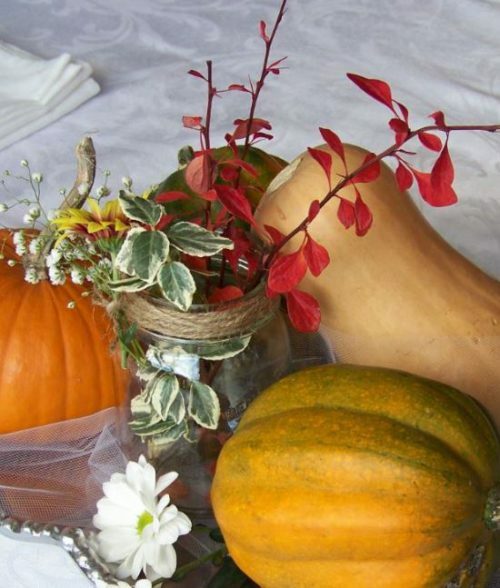 Make your own unique fall wedding centerpieces with pumpkins, flowers, and fruits! This will contribute to making it an unforgettable day for all your guests. If you think that pumpkins look too “Halloween” for a wedding, the following decoration assortments will have you change your mind. 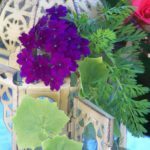 All of these centerpieces are extremely easy and inexpensive to make. Here’s what you’ll need to make this centerpiece. The featured or center element is a mason jar decorated with flowers and natural rope. If you’d rather use something else then a mason jar, try using a small ceramic vase or a small tin bucket. Interestingly, all branches and flowers used in this centerpiece can easily be found in autumn where I live in North America. The colors may vary depending on the hardiness zone where you live. For example, the berberis branches I used are usually a dark purple color in the summertime. Dogwood branches stay pretty much the same until frost. One more thing: be careful when manipulating the berberis branches! They have sharp fierce thorns that really hurt even with gloves! Its spectacular color in autumn compensates for this ferocious trait. The following picture shows a closeup of a simple mason jar filled with the vibrant fall colors of Berberis plant (red branches). I’ve found these plants in my own backyard. 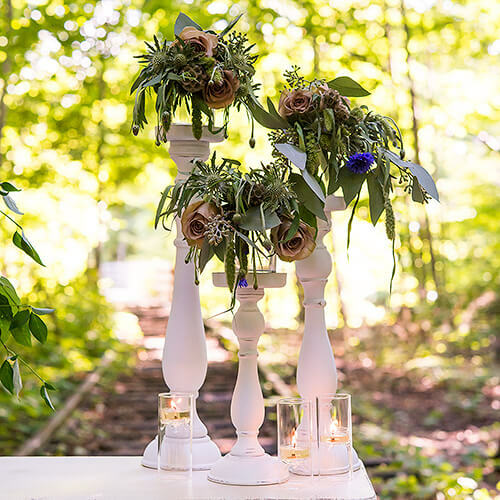 Take the time to look at nature around and you’ll see how many possibilities there are to create unique table centerpieces for your fall wedding. Euonymus plant (green-white branch) and daisy-like flower. This one can easily be replaced by chrysanthemum at this time of year. The small white flowers are called Gypsophila or baby breath and are very popular in any type of wedding flower decorations. These are the only flowers I had to buy from a florist which represents considerable cost savings. That’s right, everything was available in my own backyard! Tray, 16″ long at least to contain the pumpkin, 2 or 3 squashes, and a small flower container. No need to spend $50.00 on a silver tray that will tarnish. Plastic trays can be spray paint in any glittery color of you liking. Lightweight aluminum trays are a perfect option too as they are not expenses and can be found at the nearest dollar store. Buying wholesale can also be quite profitable depending on the number of trays you need. The following centerpiece is my favorite. I love the idea of displaying edible fruits and using them in an unexpected way (e.g. to create ambient light!). Unique centerpieces don’t have to be complicated. Its unparalleled originality will surely pique your guest’s interest for very good reasons. This may sound obvious but make sure the candles are straight up and secure to stay this way. Also, ensure that nothing comes into contact with the flame to prevent fire hazards. The fruits are round and therefore, they tend to roll over the tray or surface. Make some tests and use some kind of solid material rods (wooden toothpicks or plastic straws) and insert two pieces in each fruit in a way that they are linked between them. Try to move them to see if it holds well. Another option is to use LED tea lights. They are inexpensive and last longer. Since LED tea lights have batteries and apples or pears are watery make sure they don’t touch it directly. This video from wayfair.com explains how to incorporate flowers and other decorative plants to get a stunning result. The autumn colors are there and it’s very pretty. Of course, I encourage you to make it a more “wedding spirit” version of it. Still, the steps are well explained without being too detailed. I think it’s a good basis to learn how to make a flower vase out of a pumpkin. You can find branches and leaves in parks and green areas in your city and save a lot of money. Please, make sure you harvest in a respectful way using dead branches on the ground instead of cutting healthy ones from trees and bushes. 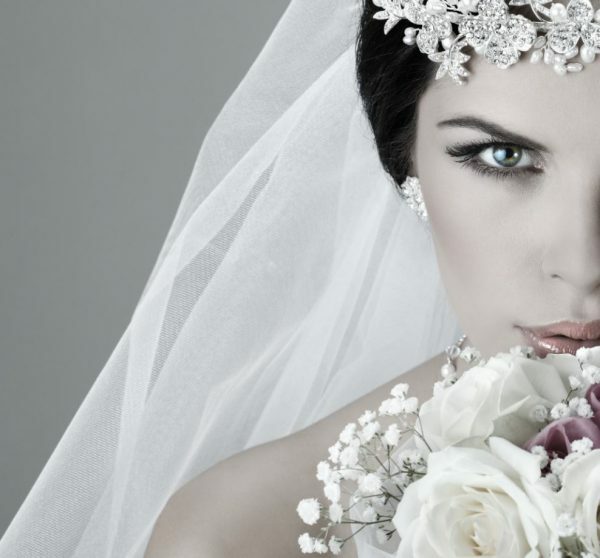 Remember that flowers will fade and will be thrown away in the garbage in a few days following your wedding day. But you will have to pay for your wedding expenses for weeks to come. Might as well save where you can and table centerpiece flowers are one good place to start. Use what’s available and abundant outside and mix with florist flowers for what you can’t find. 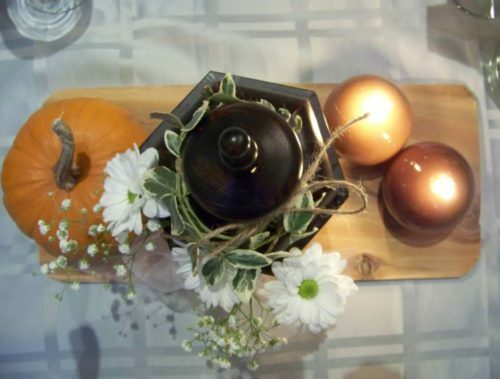 There are many ways to create unique and inexpensive fall wedding centerpieces decorations. One way to achieve this is by using what nature provides at this specific time of year and add your personal touch to it. Warm colors like orange, yellow, gold and bronze put the emphasis on the autumn theme you may have chosen. Adding white or silver accents will give it the nuptial vibe that you are looking for. Nature isn’t repeating the exact same pattern so why make all your table centerpieces decorations identical? Play with ideas you will find here to make each table decoration an exclusive creation. Your guests will take pleasure in discovering the beauty of each centerpiece as they walk to other tables and talk to other guests. A good way to break the ice and have both families build bonds of friendship! The best part of it all, they are inexpensive to make, delicate and absolutely gorgeous! Burlap, bark, natural rope, are some of the elements to incorporate when decorating for a country style wedding. But there is more to it when you want to add a festive and elegant vibe. Most people tend to overdo it when decorating their wedding. 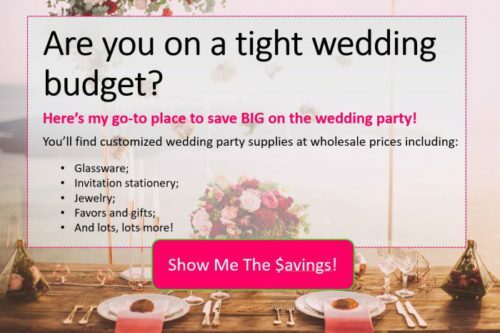 The caterer, venue, photographer, and so on… the last thing you need is to make more extravagant expenses. 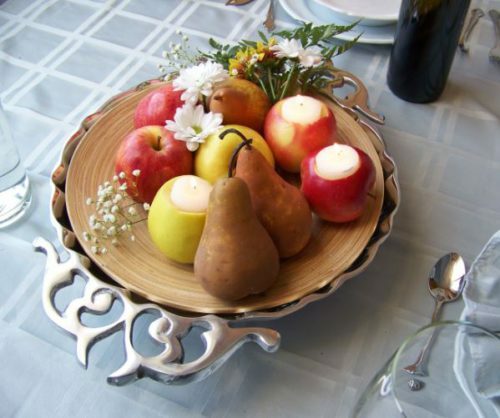 The simplest table decorations can create a warm and welcoming ambiance. One great way to make your table centerpiece stand out is to repurpose common objects like in this picture on the right. Instead of using a lantern for ambient lighting, adorn it with flowers and tulle. You can still put a LED tea light in it if you like. Round candles are original. These are fit for a fall theme wedding with their beige and brown colors. The cedar board has an interesting visual effect with the knots and grain of the wood. Its subtle wood scent increases our sense of emotional well-being. I love cedar scent! As I said earlier, don’t hesitate and go for a walk. You’ll be surprised to find so much variety and colors. You are sure to discover hidden treasures that will make your centerpieces unique. This should be very inspiring! 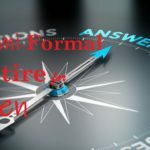 If you have any questions on where to find any of the products mentioned or need more information on the techniques used to make these centerpieces this posts, leave your questions in the comment section. I will get back to you shortly. I’m always glad to help!